Announcing the availability of the TeeChart for .NET with 100% C# Sources 4.2019.2.8 release. Announcing the availability of the latest TeeBI for RAD Studio 1.4.2018.1220 release with full RAD Studio 10.3 Rio (RX/DX/CX) support. Announcing the availability of the latest TeeGrid for VCL/FMX 1.07 release with full RAD Studio 10.3 Rio (RX/DX/CX) support. Announcing the availability of the latest TeeChart VCL/FMX 2018.26.181203 release with full RAD Studio 10.3 (RX/DX/CX) support. Announcing the availability of the TeeChart for .NET with 100% C# Sources 4.2018.11.27 release. Announcing the availability of the latest TeeBI for RAD Studio 1.3.2018.0814 release with full support for TeeChart Standard/Pro v2018.25. Save up to 20% by bundling Steema VCL/FMX products! Steema is pleased to announce the introduction of the teeSuite for RAD Studio developers. Announcing the availability of the latest TeeBI for RAD Studio 1.2.2018.0328 release with full RAD Studio 10.2.3 (RX/DX/CX) support. Announcing the availability of the latest TeeGrid for VCL/FMX 1.05 release with full RAD Studio 10.2 Tokyo Update 3 (RX/DX/CX) support. Announcing the availability of the latest TeeGrid for VCL/FMX 1.04 release with full RAD Studio 10.2 Tokyo Update 2 (RX/DX/CX) support. Announcing the availability of the latest TeeBI for RAD Studio 1.1.2018.0104 release with full RAD Studio 10.2.2 (RX/DX/CX) support. Announcing the availability of the latest TeeGrid for VCL/FMX 1.03 release. Steema is pleased to announce the availability of the first release of the TeeBI component suite for Embarcadero RAD Studio, Delphi and C++, VCL and Firemonkey frameworks. Announcing the availability of the latest TeeGrid for VCL/FMX 1.02 release with full RAD Studio 10.2 Tokyo (RX/DX/CX) support. Announcing the availability of the latest TeeChart VCL/FMX 2017.21.170329 release with full RAD Studio 10.2 Tokyo (RX/DX/CX) support. In response to the good news from Embarcadero, of the new release of RAD Studio 10.2 Tokyo, Steema would like to inform you that is working to finalise updates to both TeeChart and TeeGrid components for installation to the new IDE under Delphi & C++ Builder. A new build is expected to be available very soon. Please note that TeeChart sourcecode customers can already compile and install TeeChart to RAD Studio 10.2 by using the TeeRecompile utility. Stay tuned via this news section and use Steema Support forums to send feedback. Announcing the availability of the TeeChart for .NET 4.1.2017.03140-03146 release. Announcing the availability of the TeeChart VCL/FMX v2017.20.170306 release. Congratulations Microsoft on the release of Visual Studio 2017! Congratulations to Microsoft on the release of Visual Studio 2017 and Happy Birthday for the 20th anniversary of Visual Studio! Steema is pleased to confirm that TeeChart for .NET charting library already integrates seamlessly into new Microsoft IDE. Steema is pleased to inform you of the availability of TeeGrid for VCL/FMX v1.01 release. Steema is pleased to announce the availability of the first release of the TeeGrid Grid component for Embarcadero RAD Studio, Delphi and C++, VCL and Firemonkey frameworks and Lazarus FreePascal. Steema is pleased to inform you that TeeChart for .NET Charting library integrates seamlessly into latest Microsoft Visual Studio 2017 RC. Steema is pleased to present the TeeGrid Component Library for Embarcadero RAD Studio, Delphi and C++, VCL and Firemonkey frameworks and Lazarus FreePascal. 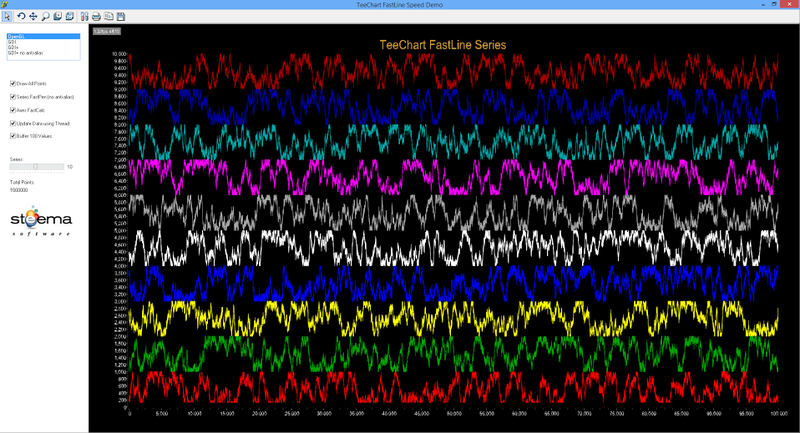 Announcing the availability of the latest TeeChart VCL/FMX 2016.19.161025 release. Steema is pleased to inform you that TeeChart for .NET Charting library integrates seamlessly into latest Microsoft Visual Studio 2015.